I have probably eaten at Culvers 100 times, maybe more, all around the Milwaukee area and elsewhere in the state. Not once have I ever had a bad experience. 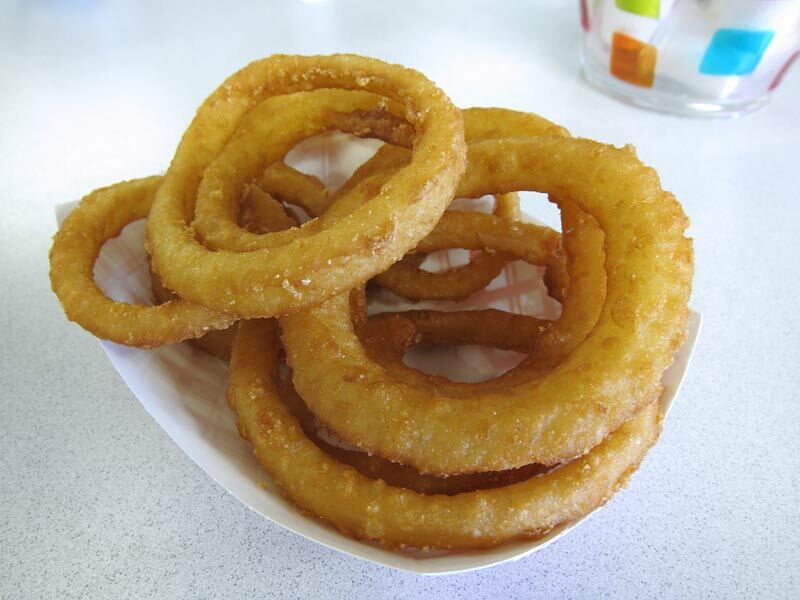 Burgers are always fresh and delicious, fish fry is always perfectly cooked, fries are always served hot (never cold or soggy) and the place is always clean, and employees are always friedly and dressed nice. Culver's has a better cod fish fry than a great deal of much "nicer" restaurants. 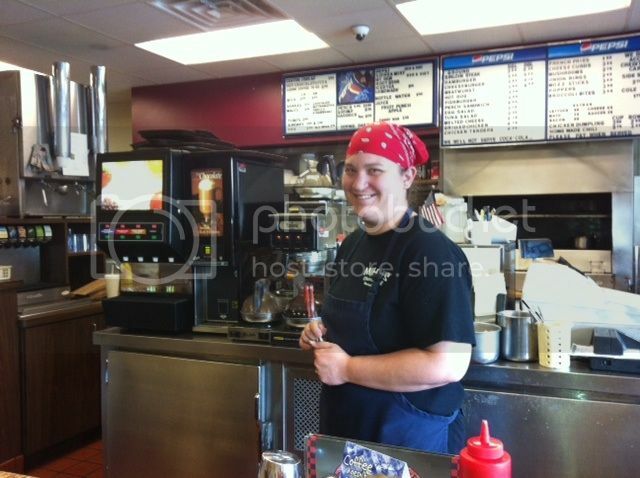 Though it is franchised, in my experience you will find the same high standards at Culvers, regardless of ownership. Its a pretty impressive feat. Captain Mikes Pub in Kenosha has flown under my radar for years. Not any more! This place rocks with the absolutely best burger in Kenosha. 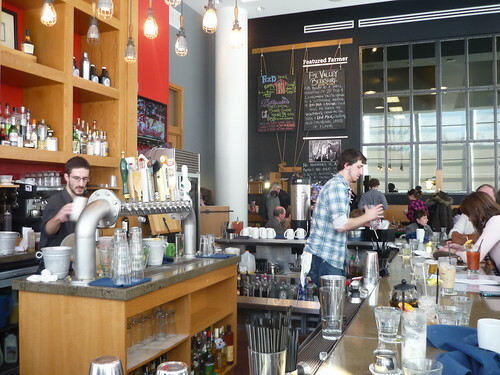 Crowded, noisy, with a major selection of great beers, and your choice of a Kobe or organic-grass fed 5oz or 10oz burger. 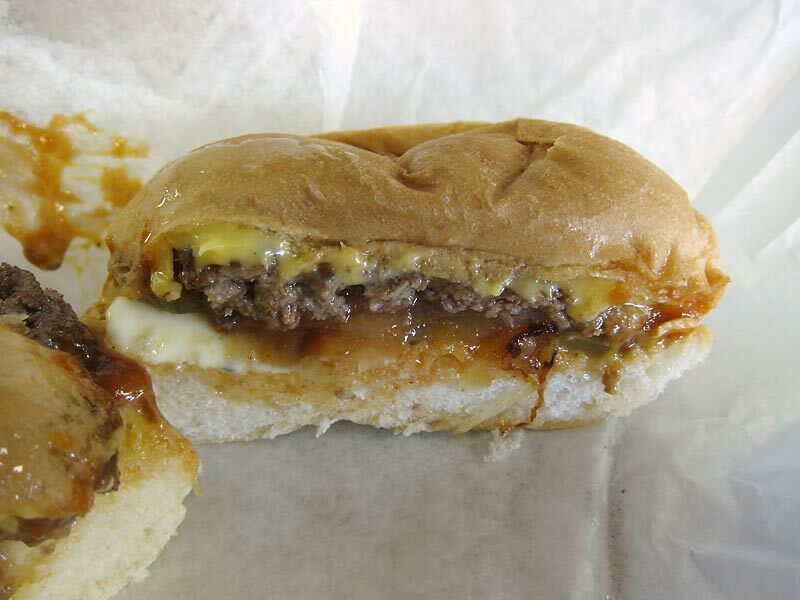 If you come to Kenosha for a burger and you miss this one, you've missed one of the greatest burgers in Wisconsin. All burgers are char grilled and should be served medium or medium rare. Hand cut fries and lobster bisque are on the menu. Da Beeef will love this joint. Pictures, you ask? I was too busy eating, drinking, and schmoozing with the customers at the bar. 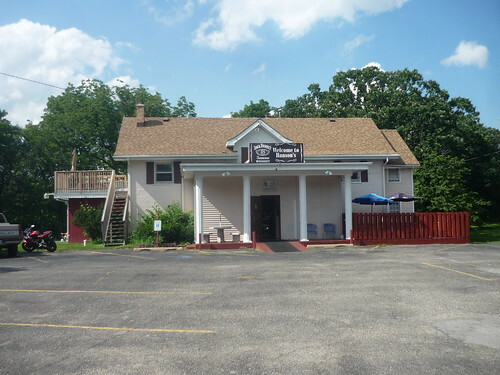 chicagostyledog wrote: Captain Mikes Pub in Kenosha has flown under my radar for years. Not any more! This place rocks with the absolutely best burger in Kenosha. Crowded, noisy, with a major selection of great beers, and your choice of a Kobe or organic-grass fed 5oz or 10oz burger. 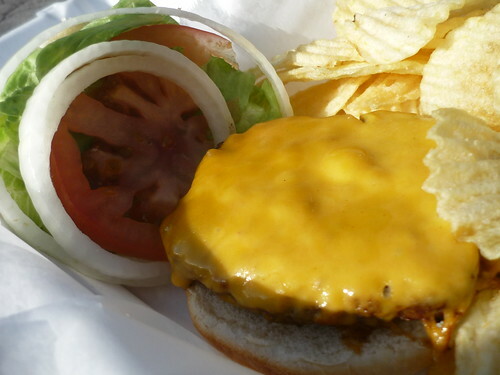 If you come to Kenosha for a burger and you miss this one, you've missed one of the greatest burgers in Wisconsin. All burgers are char grilled and should be served medium or medium rare. Hand cut fries and lobster bisque are on the menu. Da Beeef will love this joint. Pictures, you ask? I was too busy eating, drinking, and schmoozing with the customers at the bar. Thanks for the lead. I'll be up there soon! chicagostyledog wrote: Captain Mikes Pub in Kenosha has flown under my radar for years. Not any more! This place rocks with the absolutely best burger in Kenosha...Da Beeef will love this joint. Pictures, you ask? I was too busy eating, drinking, and schmoozing with the customers at the bar. What's up CSD, helluva hangout huh? I'm a little backed up on posts and had been waiting for the weather to warm to get this thread going again. Because despite close to 50 something spots being doc'd on it with at least 85% of them worthy stops I'm still not finished. There's alot of ground round to cover. So lets knock out a Kenosha Trifecta with this one. 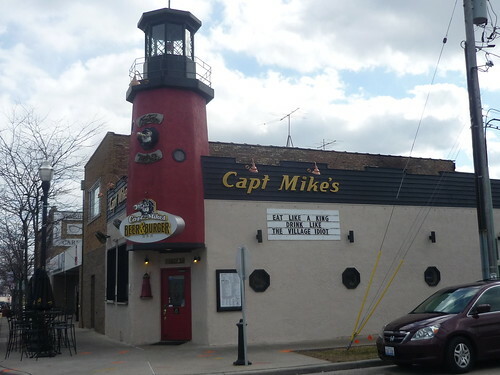 Uncle Mikes off I-94 is bigger than Captain Mike's down by the harbor but both places are generally packed. Never ate at Uncle's though. In a town with as high of a people to bars ratio as Kenosha you better do something good of you want the business. Both of these places are the best bars to drink beer at in the area. If it's something from the state that's good, they most likely have it on tap. If you're a whiskey fan they have 150+ selections of it arranged in different categories. "Eat like a King and Drink the Local Village Idiot"
Captain's has an extensive burger list ft. house made creations. I guess similar to a place like Kuma's but I haven't been there in a decade. Aside from the beer and burgers, the mac and cheese seems to be very popular with locals too. Good luck getting a seat at the bar on a Saturday. They do have outdoor seating when its warm. Burger options are somewhat overwhelming. 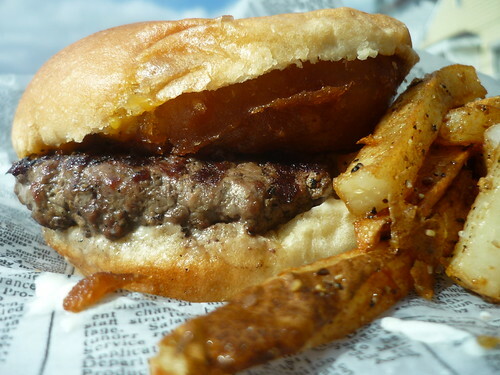 They feature fresh grassfed patty's in 5 or 10 oz options and have a variety of Juicy Lucy spin-offs with a Wisconsin flare as well as every other popular combination you can think of and deep fried options you dont want to think of. Feel free to build your own on the sheet you fill out your order on. So the burgers? Keeping it simple with an option like the "Dirty Burger" isn't a bad idea. 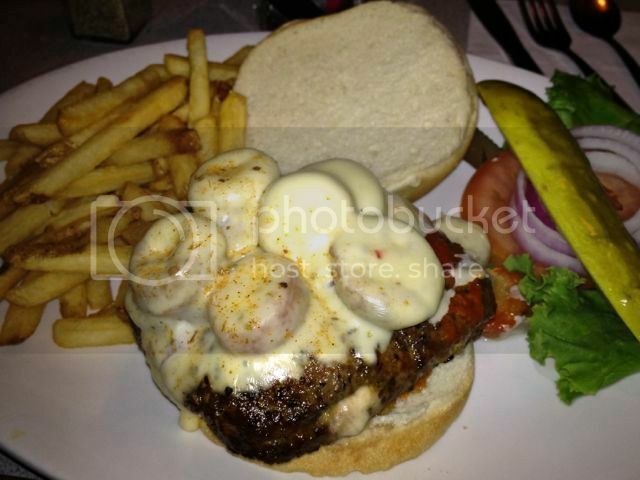 Char-grilled top quality beef topped with cheddar, a housemade black and tan onion ring, and horseradish mayo. Lettuce, tomato etc served on the side as well your choice of a side, the fresh cut fries kicked up with black pepper arent bad. I agree with CSD the burgers here paired with some beer from Ale Asylum or elsewhere in-state is best in the immediate area. I've been into Paddy's plenty of times but usually stay for a drink when it's warm and I can hang out in the yard and play bags out back. Inside it's pretty no frills as is their food and beer menu. They describe the burgers as "Not gourmet, just good" and I guess you could call them that. Unfortunately despite the promises of "Char-Broiled Sandwiches" these arent made over real charcoal like many places you'll find north up the lake. I guess for a $4 bar burger it's not bad but in state where you can get great versions of that, this isn't it. There's no shortage of old school Drive-In's and local family owned Italian food spots and such in Kenosha. 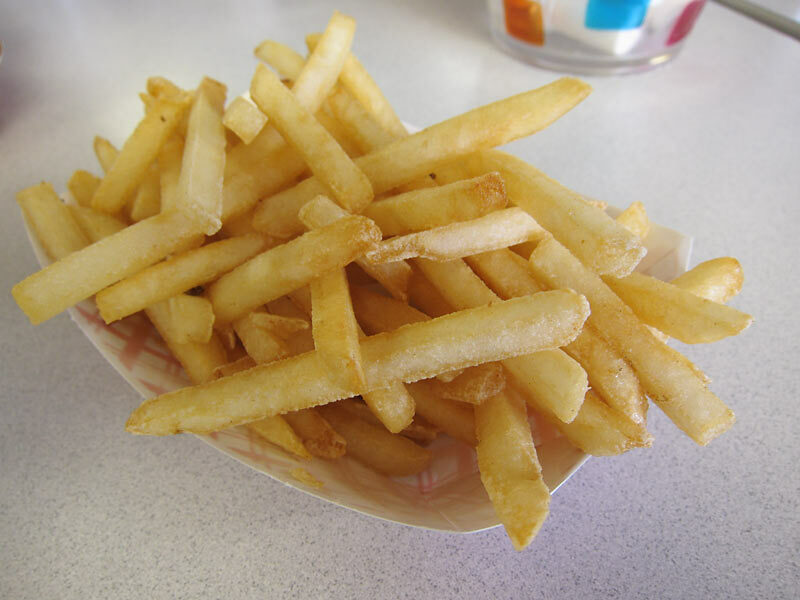 At Andy's Drive-In you can get a taste of both worlds. Up in Sheboygan where theres a heavy German population they serve brat burgers. Down in the Kenosha and Racine area where there's a heavy Italian presence they have pizza burgers. Different places put out different versions of this local treat. 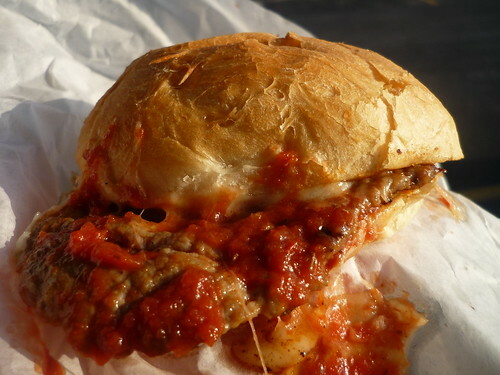 At Andy's they use an Italian sausage patty covered in marinara and melted mozzarella served on a nice locally sourced toasted hard roll. Brat Burgers or Pizza Burgers? Depends on which one I have a taste for. I had the new Pub Burger at Culver's in La Crosse Friday and it was pretty good. Culver's is my fast food reliability and variety go to choice amongst all the chains. I don't think they do anything wrong but they are a economy chain and you get what you pay for. Well, it does have a burger on it, as well as the kitchen sink. From o'Davey's in Fondy. "The most insane Bloody Mary"
Happy National Hamburger Day! 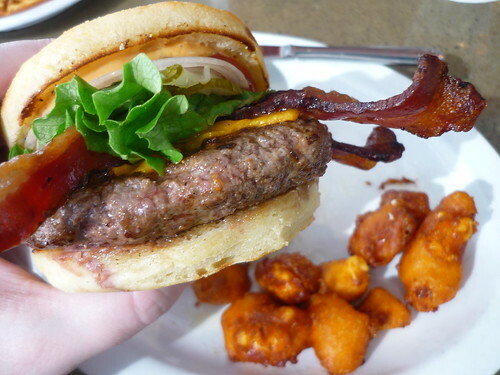 Best area with a high concentration of excellent burger options in-state? Madison. There's been countless and quite frankly pointless lists of the best places to eat burgers in America and one reason I'd call them pointless is the fact I've never seen Mad-Town included in any. If you haven't been keeping up, go ahead and scroll thru this thread to find some of the best burgers in the state are located here. The reason it's as good of a place as anywhere for one is they have all sorts of excellent reps. Both the blue collar barn to bar style and the fancier farm to table varieties. There's a ton of good options. Today we try Graze. This place is the casual sibling restaurant of the highly acclaimed L'Etoile. It sits right next door in a large office building with a really nice setup inside including a sky-high ceiling amongst plenty of seating with lots of light. They're slogan so to say is "from local pastures" and everything used on their menu they show where they source it from. Lots of ingredients come from farms within 90 miles. It's one of my favorite places to eat at in a great eating town. I especially like it for brunch and their critically acclaimed burger. First up. Yup, those Sassy Cow fried cheese curds are every bit as good as they look. Instead of the more common choice of beer they take a different approach using a vodka batter and serve them with made in house ranch. Splurge and spend the $3 up-charge to replace the fries. As you can see the burger is a thing of beauty as well. From the house made English Muffin and pickles to locally sourced beef, cheese, and bacon this was well worth it. The founder of Serious Eats, Ed Levine, said it was the best burger he had all year a few years back. It's in the running for 2013. 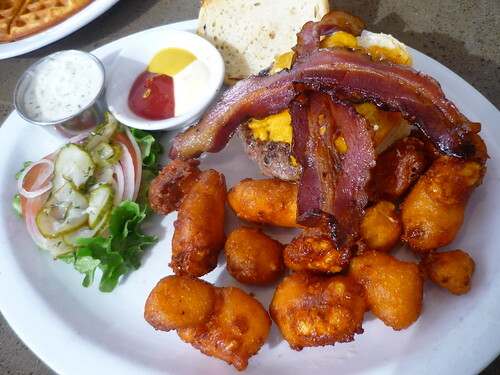 Ok, that Graze burger and cheese curds looks amazing. I am definitely going there when I'm in Madison. Thanks for the pics and heads up! 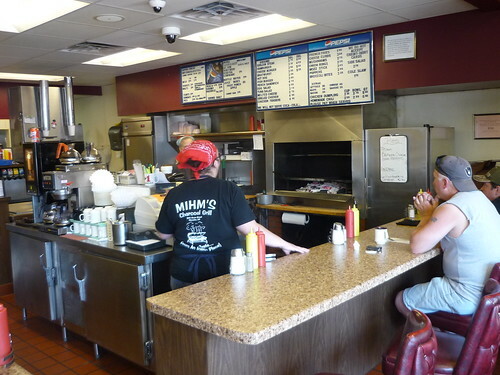 Mihm's holds a special place in my heart as I went to High School in Neenah and Mihm's in Menasha was a ritual for all. At that time it was called Rudy's, established by Rudy Mihm in 1958. The original location is quite close to its present location but has another 'joint' of some sort occupying the original small space. Originally Rudy had a small fireplace on the back wall with red brick and grilled everything on charcoal. Mihm's still uses charcoal and it tells in the taste. The steak is now ground and no longer a minute type steak but the crusty bun and run over butter make a mockery of Solly's. Mihm's has conventional hours whereas Rudy mostly opened to coincide with the bars closing and if the fishing was good on Little Lake Butte Des Morts, Rudy's might not be open. 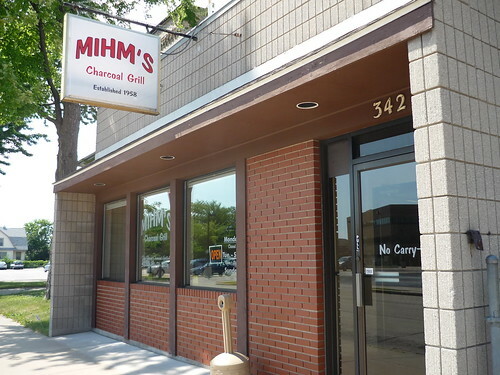 Mihm's is a short hop on 114 to Chute St, off hwy 41 on the way to Green Bay. We made the trip this morning to get some miles on the new ride, just don't speed in Racine County, as always numerous speed traps. If you scroll down to 4/27 on the Facebook page, you will see photos of Rudy. Rudy's hair was black when I knew him. My apologies if this is off topic, but I could not find the thread that caused me to go into Brownsville, Wi as I passed going "nordt" to pick up brats. Hoff's was mentioned as a place to visit. Very expensive, unclean grocery, decent quality sausage and tasty items. But Very Expensive. Exceedingly expensive. As I stopped there, I did walk the area and the people I met in the town were wonderful. Reminds me why I choose to live in snow territory. I have driven by Hoff's Red Owl literally hundreds of times, always on Sunday coming back from goose hunting. They have a Brat Festival every year. 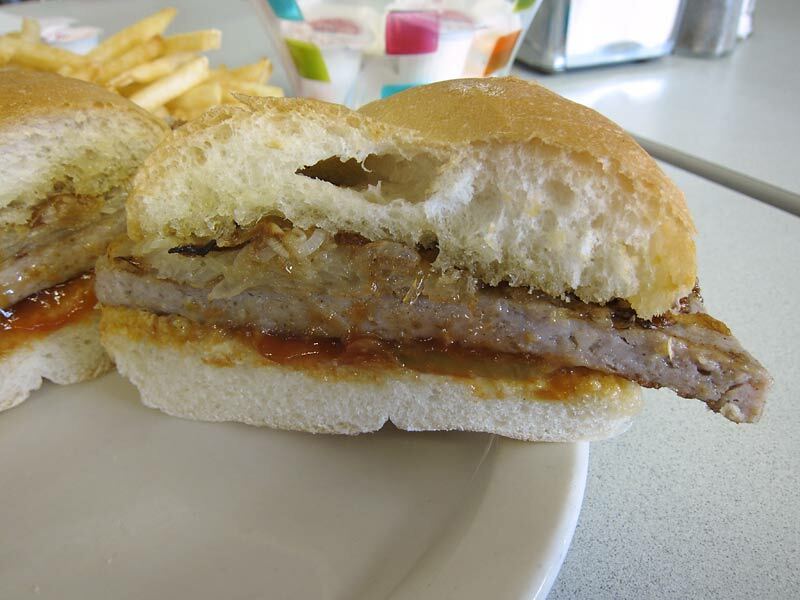 We usually stop for Brats on Sunday on HWY 49 just East of the Horicon Marsh before HWY 49 makes its curving drop down to the Marsh. VFW or something is selling Brats at a small stand. 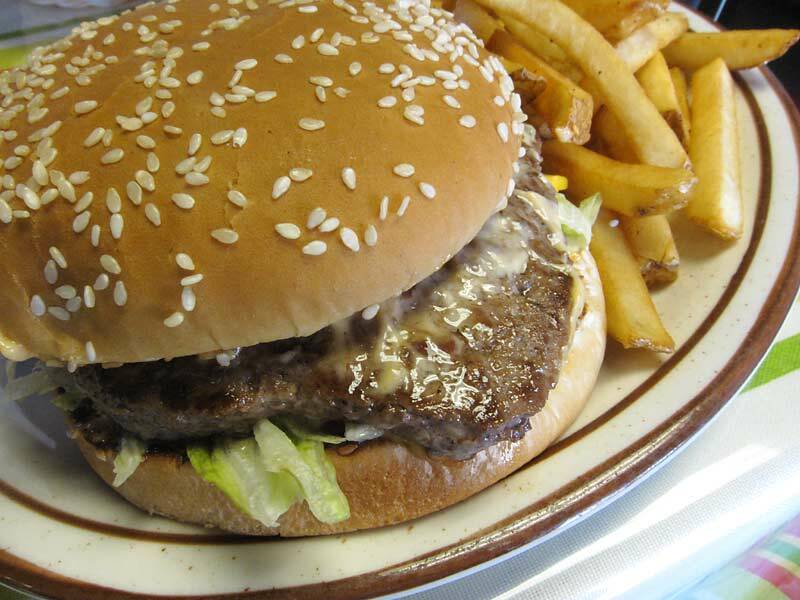 But getting back to burgers, the reason we stop on Sunday is that Chile John's in Beaver Dam is closed on Sunday's, so on any other day it's a bowl of chile, Burgers and fries at John's. John does not make an appearance anymore and may well not be with us anymore but his son Chris runs the place. Excellent burgers, great fries served communally if three or more. But it's the breakfasts that are legendary for me. 2 or 3 stack with 'meat'. I can never get over restaurants in Wisconsin for breakfast, I usually just order pancakes and the inevitable question is "Do you want meat with that?". John showed me how to eat pancakes, each cake in the stack recieves whole milk, butter and syrup! It's a great way to assure you won't get hungry while it's wet and cold standing in the Marsh for 4 hours or so. BTW, no relationship to the place in Green Bay. budrichard wrote: Mihm's holds a special place in my heart as I went to High School in Neenah and Mihm's in Menasha was a ritual for all. Hey Buddie thanks for the reminder about Mihm's. Nice place to have as a regular round in your rotation. I stopped thru two years ago en route home from a trip to the Northwoods and enjoyed my visit. budrichard wrote: Originally Rudy had a small fireplace on the back wall with red brick and grilled everything on charcoal. Mihm's still uses charcoal and it tells in the taste. The steak is now ground and no longer a minute type steak but the crusty bun and run over butter make a mockery of Solly's. We tried both a burger (steak) and a brat. 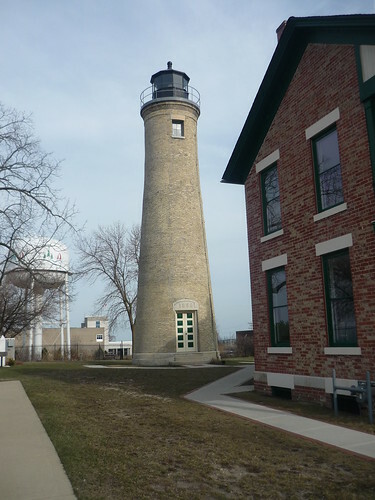 Being only an hour west of Lake Michigan it's got the same style and longevity of many of the places up and down it featured upthread. From the real charcoal grill to which you mention as "minutes" are popular in Sheboygan as are the hard rolls. For those not in the know. "Restaurant Steak meat comes from the hindquarter of the animal. We (Miesfeld's) use inside round meat that is 100% fat free. Then we add a little beef suet so when you grill it, it isn't so dry. Spencer Steak meat comes from the front quarter of the animal. We use the rib-eye roll and leave the natural fat in the steak. They are both processed the same way and they both have NO CORDS" I totally agree when the char grilled meat meets the buttered hard roll with melted cheese topped with raw onions and brown mustard Mihm's totally slaps Solly silly. 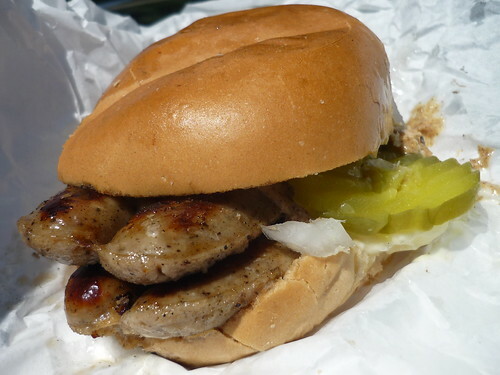 The brat was also top notch. We went with a double and instead of the popular brat burger patties used around Sheboygan they serve theirs with a split link. Even if rolling solo I'd have to have one of each the next time life brings me thru here. Da Beef wrote: Mihm's totally slaps Solly silly. Bold statement that I would shrug off with a chuckle if it came from most anyone aside from Da Beef. Seems I'm heading to Menasha one of these days. I didn't really expect to find one, but Mihm's has a website. Personally, as someone who lives almost within walking distance to Solly's, I do not understand why it is so highly rated. I only go there when taking someone from out of town so they can say they have been there. Not to denigrate Solly's but I agree with exvaxman 100%. The bun at Solly's is identical to the one's you can purchase at Sam's Club by the 16 count and the onion reduction just puts me off. Mhim's beats Kroll's in Green Bay by a little but both have been a staple with me for decades and I won't drive past either. Chile John's in Beaver Dam is full of good pre and post hunting memories for me and as such is certainly colored in my memory. 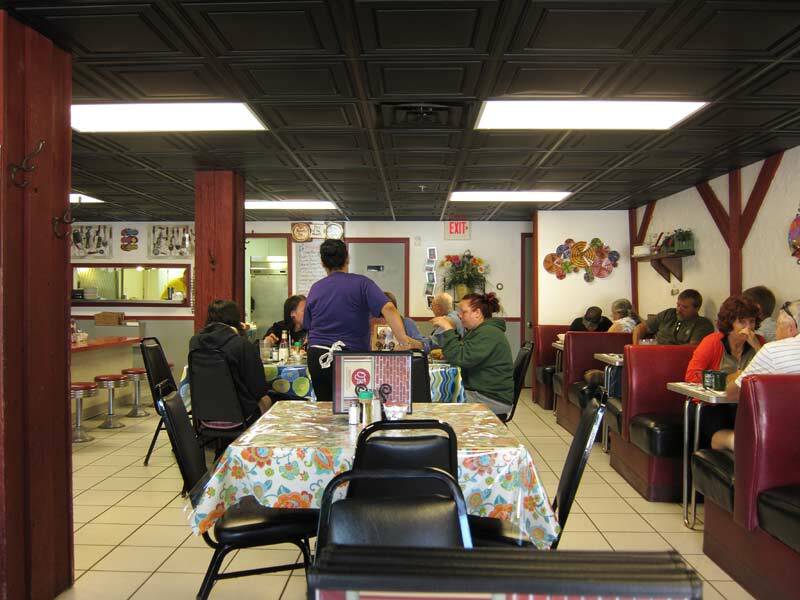 We also stop for at John's for pancakes after canoeing or kayaking the Horicon Marsh, . We put in at dawn and come back in 3 hours ready for carbs. If you remember the good steak place in Plymouth, I would appreciate hearing about it. As a member of the Windy City and Badger BMW Clubs, doing driving schools every spring and fall at Road America since 1985, two local Plymouth restaurants come to mind. While not a burger place, Dino's in Plymouth serves a respectable thin crust pizza. Check out the 52 Stafford for dinner. If it's a weekend, you'll need a reservation. I hit a couple of Wisconsin burger joints over the holiday. On Thursday we stopped at Sobleman's just 15 minutes before they closed early for the 4th. Burger was solid, though I wouldn't say it was in my starting lineup. 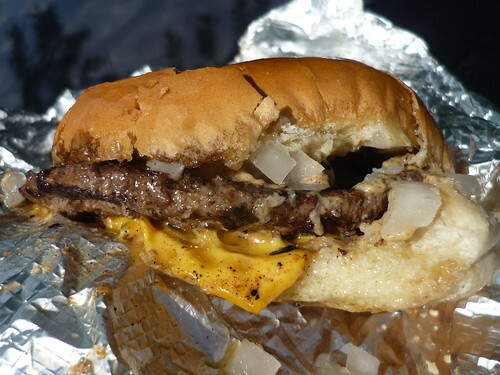 It reminded me of a simpler Beinlich's bar type of burger. I'd go back, but want to try others first like AJ Bombers. I was at Graze in Madison on Friday night and had the burger there. I was surprised at how small it looked on the little English muffin, but it ended up being just right (trying not to overeat). I really enjoyed it, great bacon, the beef was tasty too. The muffin was interesting, but I don't see myself switching to this type of bun for burgers at home. I'm glad we got the cheese curds, they were excellent, and I have to say I was very happy I had fries with my burger because they were great as well. Good call on this one Da Beef. I first started eating burgers on an English muffin when recreating Michael Symon's Lola burger from his Live to Cook book. I probably alternate about 50-50 between the English Muffin and regular buns, with the occasional pretzel roll. I like how it really can stand up to the messiest burger and I like the chewiness of them. I don't like them when I add a lot of toppings but for a straight-forward burger with maybe just cheese and onions, they are awesome. 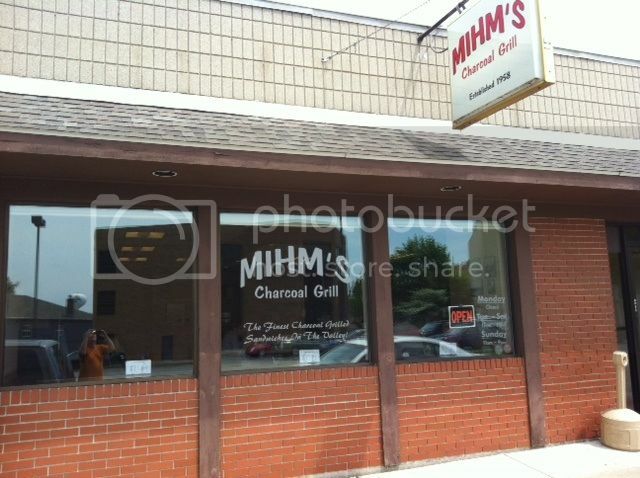 I'll add my voice to the choir singing the praises of Mihm's. The steak sandwich with cheese is all that others above have said it is. When they say grilled, they mean it; the flavor of the grill was extraordinary. Just don't repeat my rookie mistake; I ordered it without butter and regretted it (silly me). The crispy-crusted roll - not a typical soft hamburger bun - does seem to need some butter, and I found it a bit dry without. This slightly detracted from or obscured the perfection that was the meat and cheese within. Live and learn. I'll also give a thumbs up to the vanilla shake, which I sampled from Mrs. JiLS. I'm not a real milkshake expert and probably couldn't tell a great one from just good, but I definitely know a bad one (e.g., ice crystals, too soupy or, alternatively, thick as plaster, or under-flavored), and this one was none of that ... it was very creamy, smooth, and solidly vanilla-flavored, thus delivering all that I seek from a vanilla shake. quote="Da Beef"]I went up to the Northwoods in Wisconsin for four nights for the 4th holiday and was able to check out a burger spot that had just been added to my list. Phil Rohrer's is in Two Rivers, WI which is right next door to Manitowoc. It too is a pretty little town with plenty of public lakefront beach access with many people enjoying the bike trails and beaches the Saturday we made Phil Rohrer's our lunch stop on the ride up to Eagle River. Two Rivers is about a three hour ride up Lake Michigan from Chicago. Phil Rohrer's has changed names (I think Phil retired) and is now Connie's Diner. They still make a great milkshake. 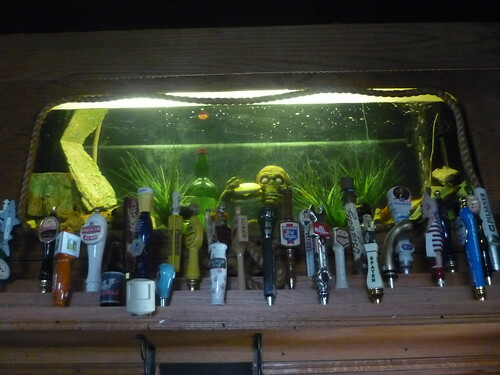 The GP wrote: Too late for your recent trip, but if you make it back up to Beloit again, check out Hanson's Tavern. There is a thread that talks about Hanson's and other Beloit options. As of June of 2012, Hanson's was still open and just as good as I remembered. Good Call! I've long chose to pass thru Beloit whenever heading to or from Madison. But your tip put it on my radar and I chose to stop in on the way back from a trip this past July. They've been at it since 1940. 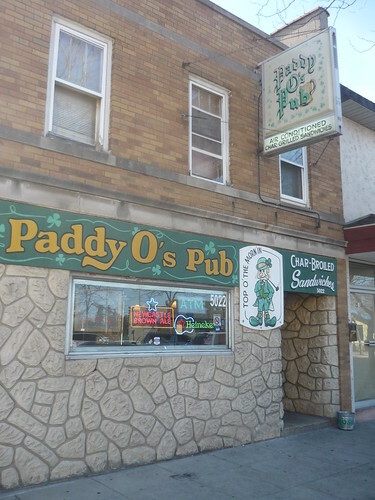 As far as looks and atmosphere goes this is a classic Wisconsin style drinking and dining establishment. A big house makes for plenty of room for families and large groups. Over in the middle of the house is the bar which like most longtime joints was filled with yocals on my visit. 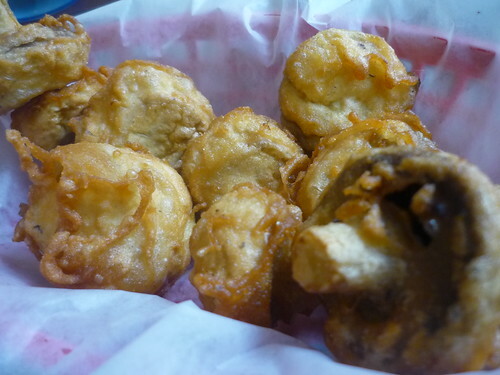 Their specialty on the app's portion of the menu are the house fried mushrooms which are fresh and came fried perfectly. As good a batch as I've had from anywhere. This thread really came in useful when we were driving up to Vilas County a few weeks ago. 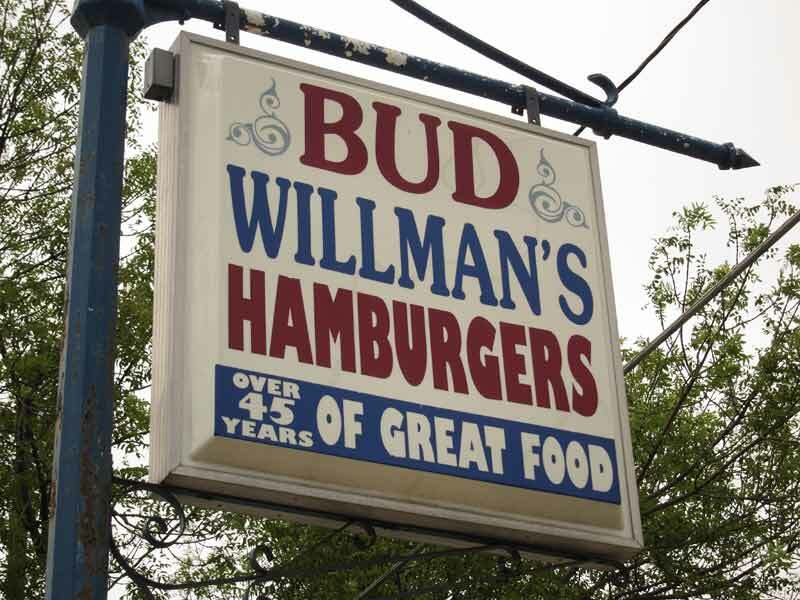 Based on Da Beef's suggestion, on the way up, we stopped in at Bud Willman's Lunch in Manitowoc . . . I thought this was an interesting and really tasty item. I was expecting a brat split down the middle but this patty was really tasty. It was served with ketchup, mustard, pickle and fried onions. I guess "large" is a relative term but that's what it's called on the menu. I enjoyed this burger but not quite as much as I expected to. It had great, oniony flavor and a nice crust on the exterior. But the meat was a bit dry and it seemed a wee bit overcooked. I probably should have followed Da Beef's lead and ordered a double (the burger in his picture looks amazing). Still, and just as importantly, the place had a ton of character, which made me really happy we'd stopped here instead of hitting some crappy chain right off the highway. Several breakfast items being served to other diners looked great. I'll keep those in mind for the next trip and another thread. 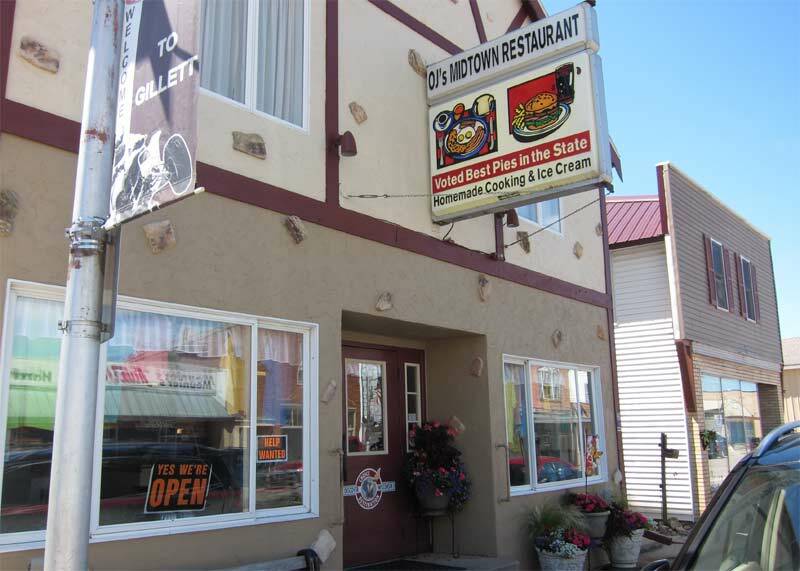 On our way back south, we stopped in Gillett, at OJ's Midtown Restaurant. The friends we had visited up north recommended it to us -- and they specifically told us to order the burger . . . This burger, ordered by my wife, was quite delicious and I'm sorry I didn't order one, too. It was almost like a home-made-tasting version of a Big Mac. I thought the juicy, carefully grilled patty was really tasty and the thousand island and other condiments were applied abundantly but in a way that made the burger a real pleasure to eat. Yeah, we saw what the sign outside the restaurant said. 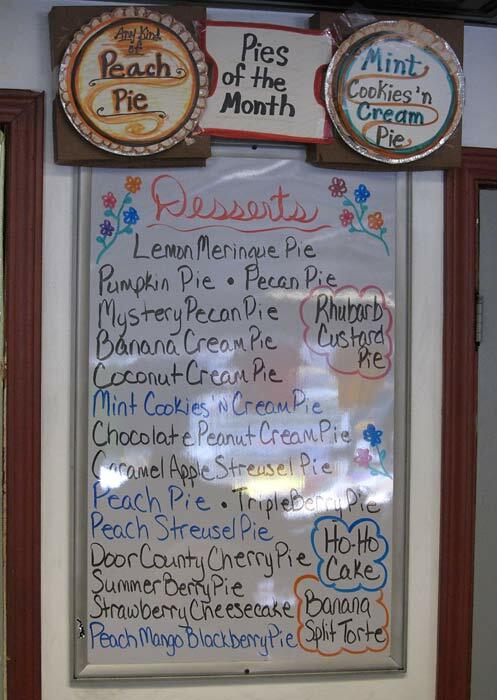 Our friends never mentioned anything about pie. 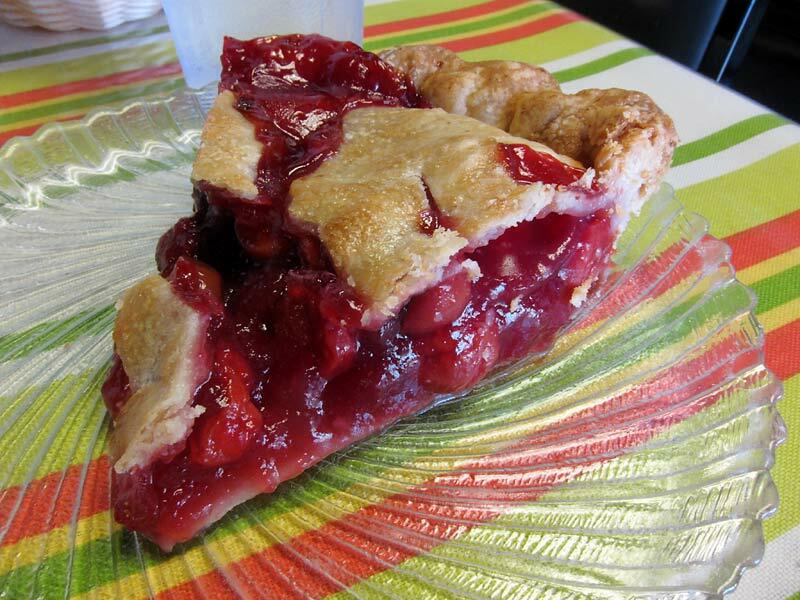 An outstanding rendition with a buttery, ultra-flakey crust, and a delicious tart cherry filling. We also ordered a few other things (not pictured) that didn't knock our socks off but the burger and the pie made OJ's an absolutely worthy stop and one I'd happily make again. Da Beef wrote: Good Call! I've long chose to pass thru Beloit whenever heading to or from Madison. But your tip put it on my radar and I chose to stop in on the way back from a trip this past July. They've been at it since 1940. As far as looks and atmosphere goes this is a classic Wisconsin style drinking and dining establishment. A big house makes for plenty of room for families and large groups. Over in the middle of the house is the bar which like most longtime joints was filled with yocals on my visit. Their specialty on the app's portion of the menu are the house fried mushrooms which are fresh and came fried perfectly. As good a batch as I've had from anywhere. I'm glad you got to Hanson's. I've had those mushrooms -- they are excellent. I am a big fan of this thread, but only vicariously, since I maybe make it up to WI once a year and usually en route to da UP. So pardon my laziness to not google map each of these small town joints to figure out which might be on the way for us on our next trip up north. Tomorrow we head up to Marquette via the typical route of 94 to Milwaukee, then 43 to Green Bay, and 41 to Marinette/ Iron Mtn. Can I get some recommendations on a great burger along the way that won't put us more than 10 miles off track? 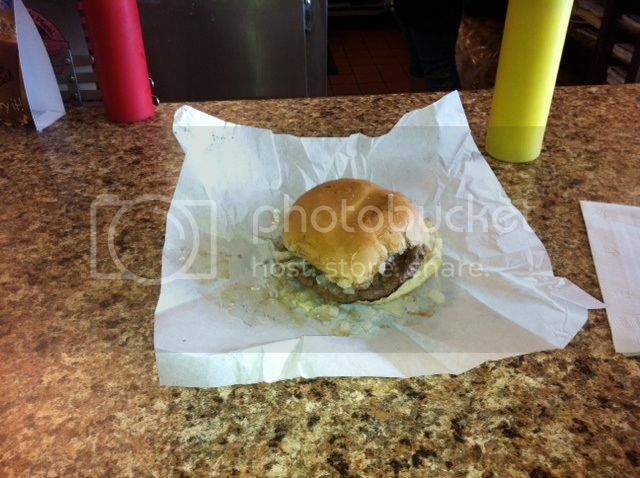 Last year I hit Mickey Lu's in Marinette and thought it was okay, charming, but not my favorite burger. I love Kewpie (and the griddled style in general) so a late breakfast in Racine could be in the cards. I'd love to try something new though, even in Milwaukee, where I've sadly not explored as much as I should. Though an old school roadside haunt would be ideal. Thanks! Last edited by Jefe on September 3rd, 2013, 11:32 am, edited 1 time in total. If you really want someone to do the work for you, I would private message Da Beef. He would know where to go right away. That's what I would do if I didn't want to re-read and map everything out. 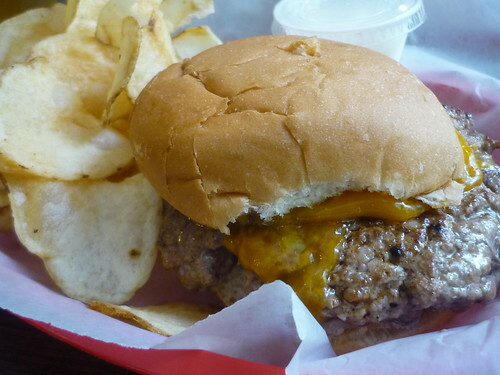 Here is a Twin Cities inspired Juicy Lucy (stuffed burger) from Re-Pete's Saloon & Grill in Black River Falls, WI. It consists of two 1/3 lb. patties stuffed wit cheese and topped with pepperjack cheese, bottle cap mushrooms and hot sauce.